A duffel bag filled with SKS rifles and magazines were among the items found Sunday on a rural property in northwest Abbotsford. The Abbotsford Police Department (APD) seized a duffle bag filled with eight SKS semi-automatic rifles with magazines and a box containing ammunition from a rural property on Sunday at about 1:30 p.m.
Const. Ian MacDonald said a caller reported finding the bag in an outbuilding on the property, located in the 7800 block of Lefeuvre Road in northwest Abbotsford. 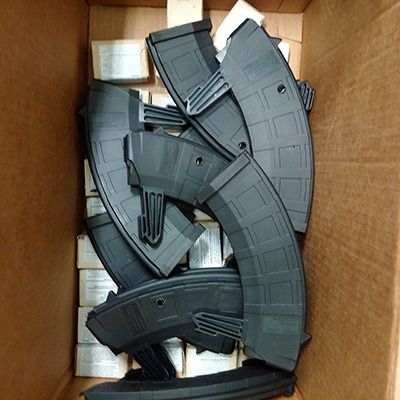 In addition to the guns, there were 34 boxes of 7.62 mm ammunition and 10 additional magazines. MacDonald said the owners of the property, a working farm, are not associated with the find. “We have no reason to believe that the owners or workers on the property are involved in any wrongdoing whatsoever,” he said. MacDonald said police believe the weapons were not there for very long and were likely stolen and deposited on the property for temporary safekeeping. He said the items are all in the hands of the forensics unit to collect evidence, and police are working to determine from where they originated. The SKS is a Soviet semi-automatic rifle that was replaced for front-line service by the AK-47 in the early 1950s but is still used as a ceremonial firearm today. It is popular in the civilian surplus market in countries such as the U.S., Canada and New Zealand, according to online sources.